Who ya got? Mordecai? Good shout. Well, it’s January, which for wrestling fans across the globe means one very important thing: it is time to follow the yellow brick Road to WrestleMania. This weekend marks the first and, arguably, most unpredictable PPV of the calendar year, the Royal Rumble, where 30 men and 30 women will be veritably yeet-ing each other over the top rope with reckless abandon, until one is left standing to point heroically at the WrestleMania sign. They will also headline WrestleMania but the pointing part is what we all come for, right? As of this writing, 23 entrants have been confirmed for the women’s Rumble match and 20 for the men’s, leaving 17 unknowns but that is, of course, half the joy of the Rumble. Will our lord and saviour, Mordecai, finally return? Will we be seeing a few surprise names from NXT making an appearance? Will Titus O’Neil World Slide under the ring apron again? Alongside the Rumble, all WWE titles will be on the line (with the exception of the Intercontinental Championship and Raw Tag Team Championships) in what is a mightily stacked card, so let’s jump right into it and look at our predictions for WWE Royal Rumble 2019. I say it all the time but, on paper, the 205 Live roster always present the early favourite of match to steal the show. I’m hard pressed to argue against that again this time with four of the purple brands top performers bound to be going all out here. It’s no secret that Buddy Murphy has been killing it as Cruiserweight Champion since dethroning Cedric Alexander, but it is hard to look past Itami in this one, especially since Daniel Bryan boosted his stock considerably with a tense promo about how Hideo was the cause of Bryan losing hearing in one of his ears. However, I don’t think it’s quite the right time to have anyone take down Murphy, yet (Itami’s day will come), so he’s my pick to retain here. From winning the Rumble last year to competing in the pre-show the next, it has been a bizarre old time for Nakamura who had an almost paradoxical 2018 with it somehow being both good and bad. Truth be told, he had a forgettable run with the US title, so the best thing to happen for it was to end up in the hands of Rusev. The Rumble, as is well documented by now, does indeed fall on a Rusev Day and, like Murphy, it is way too soon to take the title away from him yet. Although I am all onboard with The Man winning here, if for no other reason that Becky Lynch single-handedly destroys anyone who crosses her both on social media (and I don’t need that crushing shame in my life), I don’t think the match itself will be that cut-and-dry. All logic, and I’m hesitant to use the ‘L’ word because WWE and logic aren’t exactly mutually exclusive, is pointing towards Lynch finally getting her long-awaiting one-on-one match with Ronda Rousey at WrestleMania 35. Plus, she’s so damn popular now, I don’t know that a loss here would even be that damaging to The Man. While I can’t say how the finish will go down, I’m taking Asuka to retain here. While I do believe that Sasha will present the biggest challenge to Ronda so far (not to mention that Banks could really use the win here), for the reasons mentioned in the SD Women’s Championship prediction, the long-term story of Rousey/Lynch simply doesn’t include Banks as a factor. I also doubt that Ronda is in any danger of dropping the belt and it makes little sense to kill her winning streak before WrestleMania 35. The fan interest and big money all says leads towards Rowdy Ronda vs The Man at WrestleMania. Simple as that. For better or worse, this is probably the easiest match on the card to predict. When Daniel Bryan returned from a potentially career-ending injury in early 2018, the entire wrestling community was elated. AJ Styles was running the show and the leader of the ‘Yes! Movement’ was finally back and all was right again. Except, it wasn’t. Now I will admit to being a huge Bryan fan (he’s the reason I stuck with WWE and was solely responsible for reigniting my passion for the graps) but there was something lacking, something off about his comeback. You just couldn’t quite put your finger on it, but it wasn’t the same. And then *internal vegan rage intesifies* and Bryan turned heel, leading to someone of his best promo work in years, by which I mean he has dropped truth bombs about the state of the world and we boo him, because WWE. AJ and Bryan’s last few matches have been great, so it goes without saying that this addition to their rivalry will be nothing short of stellar. The ‘New’ Daniel Bryan is only just getting started, though, so he’s my pick to retain in what could be a MOTY contender. No, I’m not talking about The X-Files, obviously, but, as WWE will love to remind you, the agile Finn Balor. After plans changed and Braun Strowman was taken out of his rematch with Lesnar, Balor won a Fatal Four-Way to earn his shot against The Beast, Brooooooock Lesnar. At long last, Balor gets his one-on-one rematch for the title he never lost. Reports claim that Lesnar had been lobbying for this match (turns out Lesnar will actually try when he likes his opponent) so I certainly don’t expect Balor to get squashed here. Balor, however, will be coming into this match sans-Demon, which does look to signify a few suplexes and a loss. As much as I would genuinely love to see Balor overcome the odds, Lesnar isn’t dropping the title before WrestleMania. The first of two incredibly difficult matches to predict because it is totally feasible that WWE creative have changed their minds 1,001 times since Monday on this. All we can look to do, though, is take a step back and see what makes sense at this stage in the Road to Wrestlemania. It seems most obvious, at this stage at least, that it’ll be a Raw guy that comes out on top in this Rumble. To their credit, the red brand has at least positioned a few people to be credible opposition to Lesnar at Mania, while SmackDown’s main event picture has been largely focused on the feud between Bryan and Styles. For me, it really comes down to Seth Rollins and Drew McIntyre, both of whiom have been on a tear of late and will assuredly be in the final 4. In terms of eventual long-term payoff, though, I feel that Rollins wins here and goes onto finally topple Lesnar at Mania. 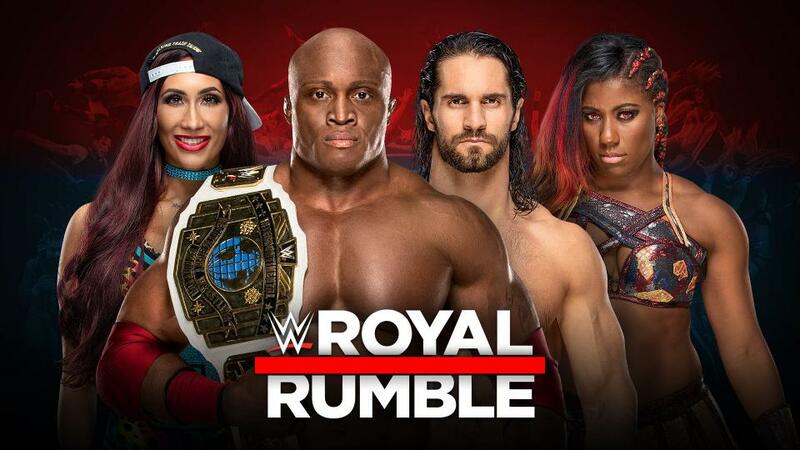 As with the men’s Rumble, for me the eventual winner will be the woman who it makes complete sense to build a top-tier storyline around in the build up to ‘Mania. To cut a long story short, I believe the final two will boil down to Charlotte Flair and The Man, Becky Lynch. It’s not uncommon to see people who’ve already had a match earlier in the night show up again in the Rumble, and, as to be expected, The Man will do whatever The Man wants. Honestly, I wouldn’t be surprised if she appears in the #29 slot (Carmella has already earned #30 after winning the Mixed Match Challenge with R-Truth. That being said, I will bet actual human money that R-Truth shows up in the women’s Rumble). While I wouldn’t be shocked to see Charlotte Flair find her way into a championship match somehow at ‘Mania, the smart money says Lynch wins the Rumble and calls out Rousey, setting the stage for ‘The Man’ to overthrow Ronda at WrestleMania. You can't work for over 20 years and not have some classics under your belt, right? A quick rundown on the Men's Royal Rumble winners to date, as well as who holds some of the records. All you need to know to help you watch WWE Royal Rumble 2019 this Sunday. Why not buck a tradition while it's still new?